My name is Dee (Angela Doreen Keane) born 1942 and sister of Frances Parsons, daughter of Brian Bissecker and granddaughter of Harry and Doris Bisseker. I was always rather in awe of my grandfather, but my grandmother was a wonderful woman. My grandmother adored babies and little children and they loved her. She spent her life helping others, visiting people who needed help or were lonely in the village. She was always going out on her bike. They did have a car, a Morris Minor and I remember the number plate to this day. JE 2931. She kindly lent her son, my Dad, the car on the few occasions we went to the seaside for a 2 week summer holiday. The car had indicators that came out of the side of the car to turn left or right. There was also a board you stepped on when entering the car. I think it had to be cranked up to start, rather than turning a key. Not completely sure. The car was used to go into Cambridge. I think there was a bus service that went as well. My grandmother used to grow her own vegetables. The large barn separated the house and garden from the large fruit orchard. I can remember seeing the owls nesting in the barn. The orchard had mainly apples, pears and plums. Apples and pears stored in the loft attached to the house where they lasted until the following summer. Bottling went on a lot too. No freezers then. The fruit was also given away to local people. The Bissekers were always entertaining and there was a very very short passage to the dining room next door. All meals had to be ready on the dot for my grandfather. Breakfast at 8am, lunch at 1pm, afternoon tea at 4.30pm and dinner at 7pm. My grandmother always changed her clothes for dinner and we all had to be smartly dressed. There was a gong on the windowsill of the downstairs corridor and that was always bonged for lunch and dinner, so all trooped into the dining room. That was one of the tasks all the children wanted, so it had to be taken in turns. Mrs Easy, who lived in a small house down the lane to the side of the shop next to the Old House, used to come in and clean and help out with preparing food , especially when there was a houseful. She seemed ancient to me, but was probably only about 50! I lived at the Old House with my mother on and off during the war years, which of course I do not remember. 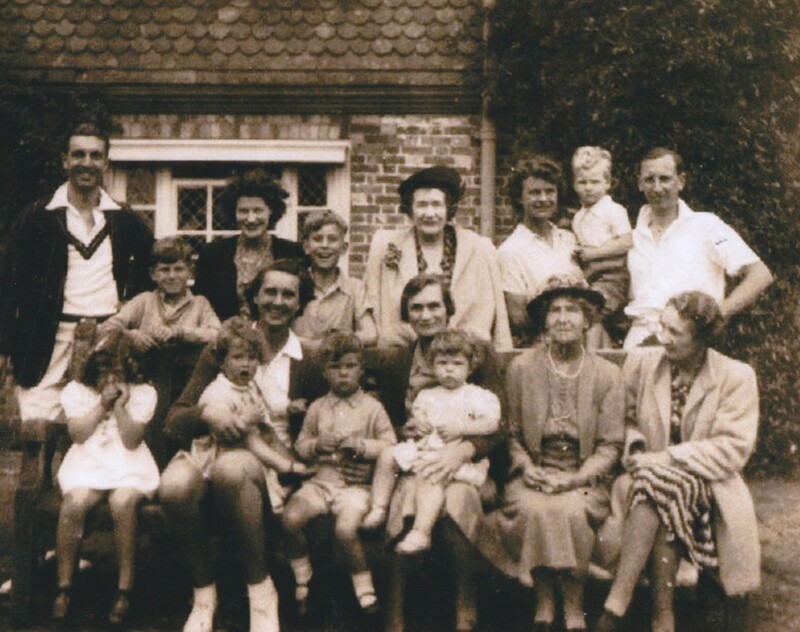 I do remember my family, who lived in Beckenham Kent, often going to the Old House for holidays and having a wonderful time there ,with my cousins. We had a massive garden to play in and a large house to run about in, when my grandfather was having his regular morning or afternoon walks, 11am and 3pm precisely. He always wore a hat and used a walking stick. Otherwise we had to keep quiet indoors so as not to disturb Grandad in his study, where we were told he was working on his sermon. Fronting the garden there was a row of enormous horse chestnut trees. We had great fun with these and the local children could pick them up too as the trees overhung the path outside. We played many simple games in those years, skipping, hopscotch and hide and seek were among the favourites. On a Sunday we were all expected to go to the local Baptist church in our best clothes where quite often my grandfather preached. I hated going but you had to do as you were told and, although I would probably argue with Mum and Dad, I would never have said anything to my grandparents. So off we went, walking there and walking back. There was a very large kitchen with stone bricks laid on the floor. It must have been cold. There was a boiler on one side which I guess powered the hot water. There was a large old fashioned cooker which I suppose was electric as there was no gas. At the corner of the kitchen there was a door with steps down into the larder where all perishables were kept. The other end of the kitchen was the scullery with a large sink and draining board. Downstairs there was a cloakroom with toilet that had a long chain you had to pull and basin. The upstairs bathroom had the same type of toilet, a large bath and basin. There was a grandfather clock to the side of the staircase and a grandmother clock on the landing halfway up. I do not remember my grandparents modernising at all, but they probably did that when they bought it. Possibly installed the electricity throughout the house but I don’t know. It was a sad day when the house was sold, but it was far too big for my aging grandmother and my grandfather had just passed away. My eldest son can just remember it. Ice cream I remember for the first time when I was about 7. There was a shop in the village that started selling it and it was a massive treat for us children to have one. We were usually treated once during the holiday and initially I am sure it was wafers only. Cornets came along a couple of years later, then we had a choice. Vanilla was the only flavour. Walls and Lyons were the only suppliers and I think the local shop just sold Lyons. The Village Hall , as I remember it, was just to the left on the opposite side of the road to the Old House. I remember looking out of the window at it and wishing I was older and could go to the local dances they had there. However, children were very much children then and it would not have been appropriate for me to mix with the local children! There was definitely a class system then. I also remember “tramps” (homeless now) coming down the drive and knocking on the back door. My grandmother would always give them a drink (not alcohol!) and something to eat. I don’t know if she gave them money. They were considered gentlemen of the road. I do not remember hearing of any crime. There was a blacksmith in the village and I remember watching him work with the horses and ironwork. We were allowed to stand there as long as we did not get too near or get in his way. Just before reaching the level crossing at Harston station on the right there was quite a large house with massive garden. Mr and Mrs Moore lived there with their 3 daughters of similar age to me. They had a hard tennis court in beautiful condition and I quite often played tennis there.